Home Books and Accounts What are Final Accounts? As the name suggests they are the final accounts which are prepared at the last stage of an accounting cycle. Final accounts show both financial position of a business along with the profitability, they are used by external and internal parties for various purposes. This account is the first account prepared as a final account, it is prepared to ascertain gross profit or gross loss incurred during an accounting period. On the debit side i.e. the LHS of the trading account items such as opening stock, purchases, and all direct expenses are shown. Gross Profit – If the total of credit side is greater than debit side i.e. RHS > LHS the excess is called as Gross Profit. It is transferred to the credit side of Profit and Loss account. 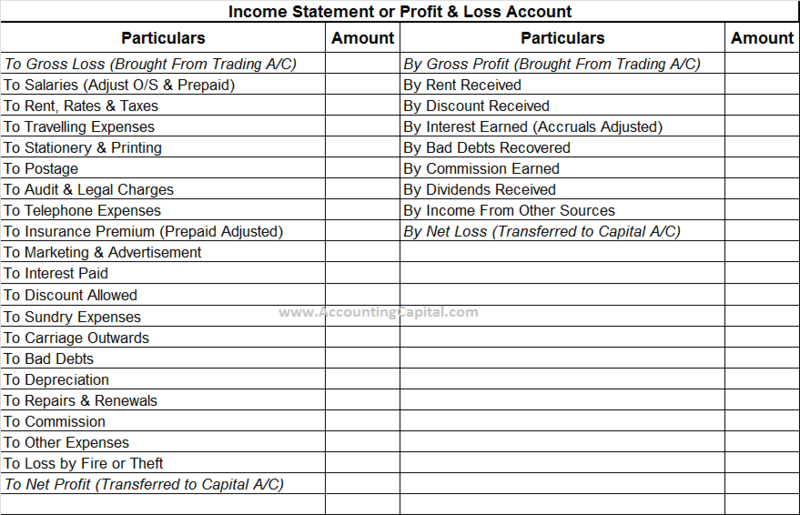 Gross Loss – If the total of the debit side is greater than credit side i.e. LHS > RHS the excess is called as Gross Loss. It is transferred to the debit side of Profit and Loss account. After preparation of trading account a profit and loss account also known as an income statement is prepared to ascertain the Net Profit or Net Loss incurred by a business. It begins with Gross Profit or Gross Loss being transferred from the trading account. On the debit side of a Profit and Loss account all indirect expenses such as salary, rent, office and admin, marketing, stationery etc. and loss incurred by the sale of assets or fire/theft etc. are mentioned. On the credit side of a Profit and Loss account all indirect incomes such as interest earned, dividends received on shares, bad debts recovered, profit on the sale of assets etc. are mentioned. Both trading account and income statement help to determine the profitability of a business whereas a balance sheet is constructed to find out the financial position of the business as on a particular date. Balance sheet consists of capital, assets, and liabilities of a business. It is a statement and not an account, it has no debit or credit side there “To” & “By” are not used inside a balance sheet. On the LHS of a balance sheet are all liabilities including capital and RHS will be all assets, for a balance sheet liabilities will always be equal to assets.